One of many variations on a theme but significantly different enough to make me want to post the recipe. While on Christmas vacation, Chris and I dined at a place called the Dock Cafe in Stillwater, Minnesota, overlooking the frozen St. Croix River. It was a total guess and a lucky one in the end. Good food and it was 1/2 price wine night. After much dithering, I went for the wild mushroom risotto with pancetta. It was very good and very filling- I couldn’t get through even half of it especially as I wanted to save a bit of room for dessert. The nice thing about this risotto was that it was creamy without a lot of added creamy fats like cream, butter and cheese. I did not recreate that risotto for dinner tonight but I was inspired by it. 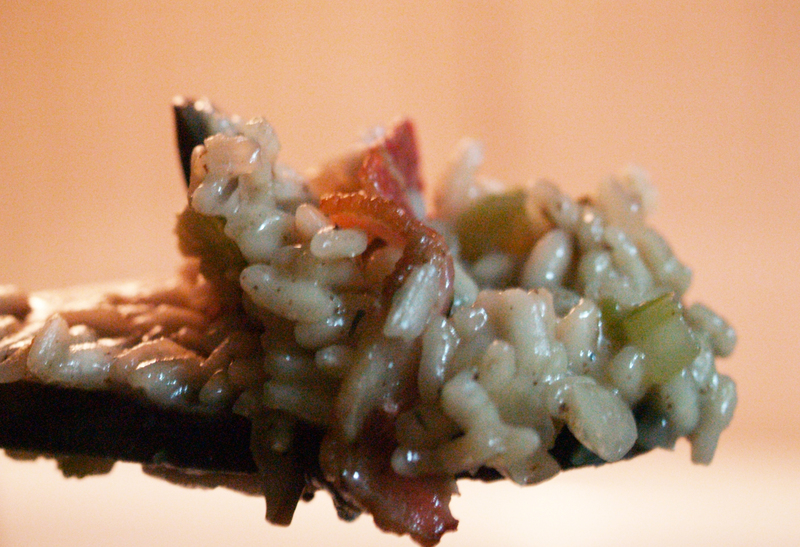 I have made risotto with mushrooms on many previous occasions, hence the post title. I also have a nice mushroom noodle thing with ground meat that shares much in common with this dish. 1. Saute bacon in large pan until crispy. Remove to paper towel-lined plate to drain. If necessary, drain some fat from pan leaving approximately 1 tablespoon. 3. Add sliced mushrooms, sprinkle with salt and cook over medium-high heat until thoroughly cooked down and most of liquid has come out of mushrooms. Remove from pan and cover to keep warm. 4. If necessary, add olive oil or some bacon fat back to pan. This step is only necessary if the pan is pretty dry. 5. Add onions, celery and garlic to pan, season with salt, pepper and thyme.. Cook until softened and onions have slighltly yellowed. 6. Add arborio rice and stir to combine. Add apple brandy (or other liquor/wine or even just broth or water) to deglaze pan. Scrape bottom of pan to pick up any tasty bits. 7. Once most of liquid from step 6 has been absorbed, begin adding 1/2 to 1 cup of broth or water to pan at a time, stirring continously until mostly absorbed then adding more liquid. 8. Continue adding broth or water until rice reaches desired doneness. Ideally this should be al dente- with a slight bite- but its mostly a matter of personal preference. 9. Return mushrooms and bacon pieces to pan along with 1 teaspoon thyme.10. Stir in 1/4 cup cheese blend. This step is also optional but as this is not a very brothy risotto, I think it adds a nice punch while keeping the mix somewhat creamy. Okay, true confession time. I almost never stir my risotto constantly as per the usual instructions. I’m usually too busy with cooking the other parts of the meal or running in to the living room to check Facebook (or something else equally important). On the night I made this, I did stir pretty much continously. At least when I have the time. It cooked much faster and actually used less broth than usual. The apple brandy was a fall purchase during a visit for cider and donuts. We sampled the wines, learned that neither of us are big fruit wine people then decided to buy the brandy, mostly for cooking purposes. I was also envisioning making a sangria type thing in the future. I had only used it once before, for an apple dessert dish that did not turn out, through no fault of the brandy. Tonight, I used it because primarily because the bottle was already open and I didn’t want to open a bottle of white just for this dish. 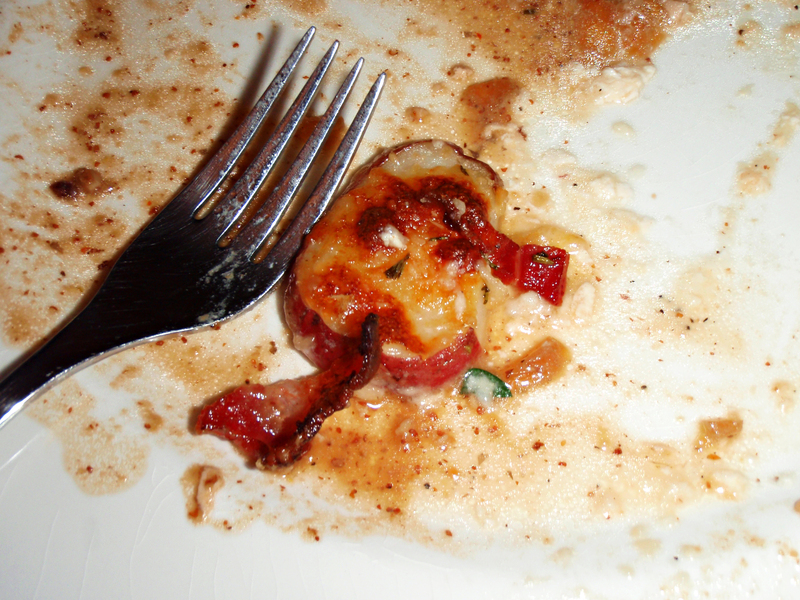 The apple flavor was pretty subtle in the end dish but on the whole, it felt more warm than when I make it with wine. A good pairing with the thyme and bacon. I updated my Facebook status during the cooking of this dish and received a comment from a friend to stop posting about food because I was making her hungry, even though she’d just ate. As it happens, she’s a vegetarian and wouldn’t be able to enjoy this particular dish but, her comment did make me think about how to adapt for the non-meat eaters. I am not a big fan of the fake bacon but if you are vegetarian and like it, then go for it. I would suggest replacing the bacon fat at the beginning with some butter though. Mushrooms cook up better in animal fats than vegetable fats like olive oil, in my opinion. Combining equal parts olive oil and butter would also probably work- I often go that route to saute onions when I’m making plain(er) risotto. If you are a vegan, you are on your own. A week ago Sunday, Chris went to bed complaining of a sore throat. Monday, he was convinced he had strep throat and went to the doctor. Diagnosis: no strep, no swine flu, no regular flu. Most likely a cold. Now, 9 days go by and I’m good, free of illness. I think I’ve won, I’ve dodged the bullet. Tuesday night, I felt a little scratch in my throat. Dang Dang Dang!! I am in the class of employees who get Veteran’s Day off and I had a list of things to do. Not one of which I did. Instead, during my day off yesterday, I watched all the Top Chef episodes from this season minus the two I’d already seen. I laid on the couch and watched people cook some crazy stuff in some crazy environments (3 kinds of ceviche after a night spent sleeping in a teepee in the Nevada desert- really? ), occasionally dozing. Eventually, I made dinner for Chris and I but I was too beat from my hard day of lounging (really, I was exhausted) so he cooked up some boneless pork ribs marinated in chimichurri sauce on the grill while I made rice and some peppers & onions with a slight South American bent thanks to some cilantro and cumin. Then, we sat down to watch the newest episode of Top Chef. The new ep featured Nigella Lawson as guest judge. The quickfire (initial short challenge, for the uninitiated) was focused around the idea of breakfast in bed from room service. I’m not a big breakfast eater but some of those dishes had the potential to turn me around- if someone else were cooking- I’m not in to breakfast because I’m not in to mornings, in general. The second part of the show was the elimination challenge where each chef had to cook a dish, inspired by a casino in Vegas, for 175 people. Nothing too mind-blowing here and the chef who should have gone home weeks ago finally went home. At the end of the show, we saw a preview for next week- the guest judge is Thomas Keller of the French Laundry- very big deal and all the competition chefs were visibly freaking out. This led to a conversation between Chris and I on who all these people were and I learned that he didn’t know who Nigella Lawson was. Now, Chris doesn’t watch food shows all the time but he likes a certain body type and usually picks up on that instead of one’s cooking ability for TV food celebs. Nigella is right up his alley, especially with her sensuous food talk, lots of oohing over flavors, moaning over aromas, etc. Cutting to the chase, I brought up her website and while we were talking, I looked at some recipes and found something I thought he’d like, no matter the source. And it used a number of ingredients we had on hand. Upon further review, I ended up making a number of tweaks. To begin, fry three slices of bacon (I used thick-cut) in a large saute’ pan. Remove bacon when done, draining on paper towels. Drain most of the fat, leaving just a thin coating on the pan. If you don’t have much fat- well what kind of bacon were you using?!? And, if necessary, add a bit of olive oil to the pan. You will probably have some crunchy bits on the bottom of the pan- leave them there. Add two chicken breasts to the pan. Cook 3-5 minutes per side until cooked through and lightly browned. Remove from pan and cover to keep warm. While chicken is cooking, chop bacon in to small pieces. After chicken has been removed from pan, add a teaspoon of olive oil, if necessary. Add garlic and rosemary to pan, cooking and stirring frequently until fragrant and garlic is turning golden brown. Add mushrooms, stir to coat then add bacon. Allow to cook until pan begins to dry then add 3/4 cup wine to deglaze. Turn heat to medium-high to bring sauce to boil. Cook until wine is reduced by 2/3. Reduce heat to low and stir in 1/2 cup creme fraiche. 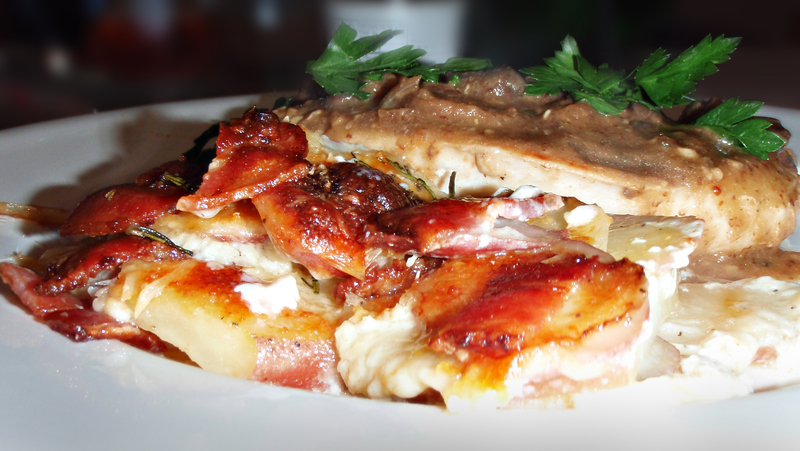 Serve in layers: mashed potatoes then chicken breast then mushroom-bacon sauce. On the side, we had steamed petite peas with just a bit of butter and 1/2 teaspoon dried tarragon. If the ingredients don’t tempt you, the pictures surely will. Except I didn’t take any pictures because I couldn’t find the camera!! Of course, this is the night my plate looked perfect- great presentation with the mushroom sauce draped lovingly over the chicken breast, small amounts of sauce pooling at the bottom, lying on a bed of mashed potatoes with a nice bright green along the side thanks to the peas. I’ll make this again. Next time, I’d like to cream up the sauce even more. I was using up the creme fraiche we had. I probably would have used more if I’d had it. The advantage of creme fraiche over heavy cream is that the creme fraiche is less likely to curdle on the high heat. You have to be more cautious with heavy cream- turning the heat down before adding and waiting a few minutes for security. Over the weekend, Chris and I stopped at a small farm stand and picked up some fresh basil, zucchini and a bag of red skin potatoes. The bag is probably about 5 pounds worth, mostly very small potatoes. I am envisioning some kind of steamed potatoes with a mustardy dressing for the really small ones. For the bigger ones, I envisioned potatoes baked with cheese so that is just what I made, borrowing heavily from this recipe at Eating Out Loud. In small sauce pan, melt butter. Add flour and cook over medium heat for about 1 minute. Whisk in milk until thickened. Stir in cheese, allow to melt then remove from heat. Add salt and pepper to taste. Heat olive oil in medium saute pan. Cook onions until golden-brown then remove from pan. Add bacon slices to pan, cook until cooked through but not crispy. Remove bacon, drain and slice in to 1 inch pieces. Layer 1/2 of potoates in a gratin or casserole dish. Sprinkle carmelized onions over potatoes than add second layer of potates. Pour gratin sauce over then top with parmesan cheese, and 1 teaspoon rosemary (finely chopped). Sprinkle bacon over top. Insert 1 sprig of rosemary, cut in half, along edge of pan. Place dish in oven, bake for 35 minutes. Chris seemed to like it.